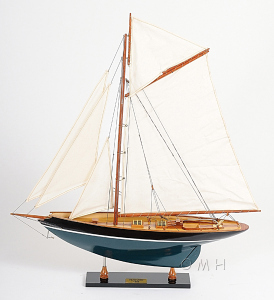 Product Dimensions (L x W x H): 26.5" x 5" x 30.7"
Built in 1898, the Penduick was one of the most beautiful sailing boats. Have it display beautifully as a home or office decor. Master craftsmen handcraft these highly detailed wood models from scratch using historical photographs, drawings and original plan. They are built to scale with high-grade wood such as: western red cedar, rosewood, and mahogany. They are 100% hand built individually using plank-on-frame construction method and are similar to the building of actual ships. Each model requires hundreds of hours to finish and must go through a demanding quality control process before leaving the workshop. This model hull is handcrafted from strips of wood using plank on frame construction method. It is then painted in green and black with white waterline. The deck is beautifully planked from many strips of wood. There are various details on the deck such as hatches, winches, and cabin. Located on the deck is a metal tilter near the companionway. The stitched sail and intricate rigging complete the definition of a true sailing boat. The model is secured tightly on a solid wood base with a brass nameplate. The mast and sail are folded down for easy packaging and shipping. 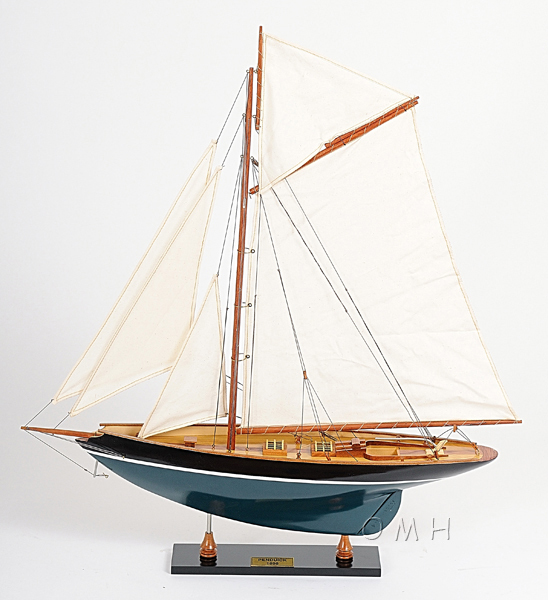 Itll make a perfect gift for home or office decorator, boat enthusiast, or passionate collector.